UML sequence diagrams overview of graphical notation - lifeline, message, execution specification, interaction use, etc. Sequence diagram is the most common kind of interaction diagram, which focuses on the message interchange between a number of lifelines. Sequence diagram describes an interaction by focusing on the sequence of messages that are exchanged, along with their corresponding occurrence specifications on the lifelines. 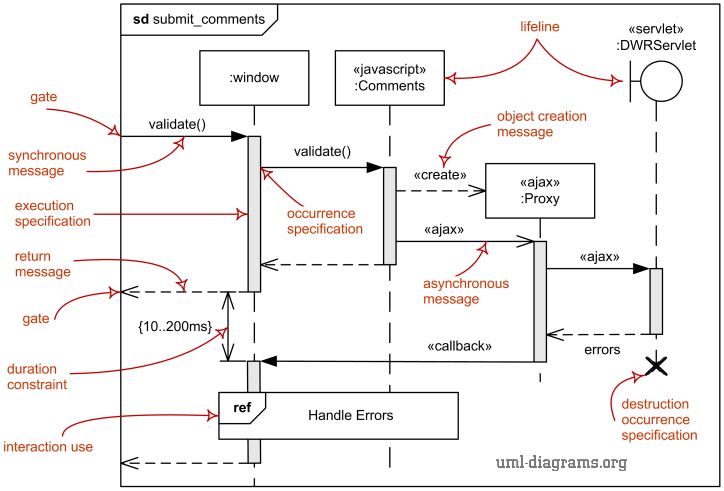 The following nodes and edges are typically drawn in a UML sequence diagram: lifeline, execution specification, message, combined fragment, interaction use, state invariant, continuation, destruction occurrence. Major elements of the sequence diagram are shown on the picture below. Major elements of UML sequence diagram. Lifeline is a named element which represents an individual participant in the interaction. While parts and structural features may have multiplicity greater than 1, lifelines represent only one interacting entity. If the referenced connectable element is multivalued (i.e, has a multiplicity > 1), then the lifeline may have an expression (selector) that specifies which particular part is represented by this lifeline. If the selector is omitted, this means that an arbitrary representative of the multivalued connectable element is chosen. A lifeline is shown using a symbol that consists of a rectangle forming its "head" followed by a vertical line (which may be dashed) that represents the lifetime of the participant. where class-name is the type referenced by the represented connectable element. Note that although the syntax allows it, lifeline-ident cannot be empty. The lifeline head has a shape that is based on the classifier for the part that this lifeline represents. Usually the head is a white rectangle containing name of class. If the name is the keyword self, then the lifeline represents the object of the classifier that encloses the Interaction that owns the Lifeline. Ports of the encloser may be shown separately even when self is included. A gate is a message end, connection point for relating a message outside of an interaction fragment with a message inside the interaction fragment. The gates are named implicitly or explicitly. Implicit gate name is constructed by concatenating the direction of the message ("in" or "out") and the message name, e.g. in_search, out_read. Gates are notated just as message connection points on the frame. Interaction fragment is a named element representing the most general interaction unit. Each interaction fragment is conceptually like an interaction by itself. There is no general notation for an interaction fragment. Its subclasses define their own notation. Occurrence (complete UML name - occurrence specification, i.e. "event description") is interaction fragment which represents a moment in time (event) at the beginning or end of a message or at the beginning or end of an execution. An occurrence specification is one of the basic semantic units of interactions. The meanings of interactions are specified by sequences of occurrences described by occurrence specifications. Each occurrence specification appears on exactly one lifeline. Occurrence specifications of a lifeline are ordered along the lifeline. Occurrence specification has no notation and is just a point at the beginning or end of a message or at the beginning or end of an execution specification. 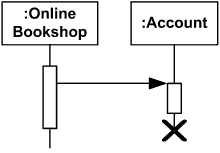 Message occurrence (complete UML name - message occurrence specification) is an occurrence which represents such events as sending and receiving of signals or invoking or receiving of operation calls. Destruction occurrence is a message occurrence which represents the destruction of the instance described by the lifeline. It may result in the subsequent destruction of other objects that this object owns by composition. No other occurrence may appear below the destruction event on a given lifeline. The destruction of instance is depicted by a cross in the form of an X at the bottom of a lifeline. Execution occurrence (complete UML name - execution occurrence specification) is an occurrence which represents moments in time at which actions or behaviors start or finish. Execution occurrence references exactly one execution specification which describes the execution that is started or finished at this execution occurrence. by two execution occurrences - start and finish. waiting for a reply message from another participant. Note, that the execution specification includes the cases when behavior is not active, but just waiting for reply. The duration of an execution is represented by two execution occurrences - the start occurrence and the finish occurrence. Execution is represented as a thin grey or white rectangle on the lifeline. Execution specification shown as grey rectangle on the Service lifeline. Execution specification can be represented by a wider labeled rectangle, where the label usually identifies the action that was executed. 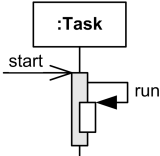 Execution Specification represented as wider rectangle labeled as action. For execution specifications that refer to atomic actions such as reading attributes of a signal (conveyed by the message), the action symbol may be associated with the reception occurrence specification with a line in order to emphasize that the whole action is associated with only one occurrence specification (and start and finish associations refer to the same occurrence specification). Overlapping execution specifications on the same lifeline are represented by overlapping rectangles. Overlapping execution specifications on the same lifeline - message to self. 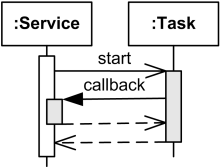 Overlapping execution specifications on the same lifeline - callback message. A state invariant is an interaction fragment which represents a runtime constraint on the participants of the interaction. It may be used to specify different kinds of constraints, such as values of attributes or variables, internal or external states, etc. The constraint is evaluated immediately prior to the execution of the next occurrence specification such that all actions that are not explicitly modeled have been executed. If the constraint is true, the trace is a valid trace, otherwise the trace is an invalid trace. State invariant is usually shown as a constraint in curly braces on the lifeline. 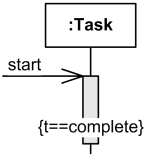 Attribute t of Task should be equal to complete. It could also be shown as a state symbol representing the equivalent of a constraint that checks the state of the object represented by the lifeline. This could be either the internal state of the classifier behavior of the corresponding classifier or some external state based on a "black-box" view of the lifeline. Task should be in Finished state. State invariant can optionally be shown as a note associated with an occurrence specification. Interaction use is an interaction fragment which allows to use (or call) another interaction. Large and complex sequence diagrams could be simplified with interaction uses. It is also common to reuse some interaction between several other interactions. Referenced interaction has formal gates. Interaction use provides a set of actual gates that must match the formal gates of the interaction. connect the formal gates with the actual ones. The interaction use is shown as a combined fragment with operator ref. 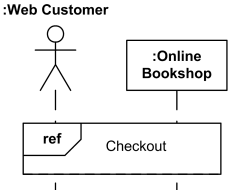 Web customer and Bookshop use (reference) interaction Checkout. The attribute-name refers to an attribute of one of the lifelines in the interaction that will receive interaction result. Note, that this restricts results of interactions to be assigned only to attributes. In real life, results of a method call could be assigned to a variable from calling method. The collaboration-use is an identification of collaboration use that binds lifelines of a collaboration. The interaction name is in that case within that collaboration. The io-arguments is list of in and/or out arguments of the interaction. 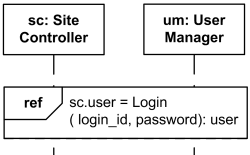 Use Login interaction to authenticate user and assign result back to the user attribute of Site Controller. 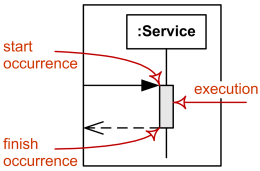 One constraint imposed by UML specification that is sometimes difficult to follow is that the interaction use must cover all involved lifelines represented on the enclosing interaction. This means that all those lifelines should be somehow located near each other. If we have another interaction use on the same diagram it could be very tricky to rearrange all involved lifelines as required by UML.